F. Bihan, J. M. Rojas, and C. E. Stella, First steps in algorithmic fewnomial theory, 2004. 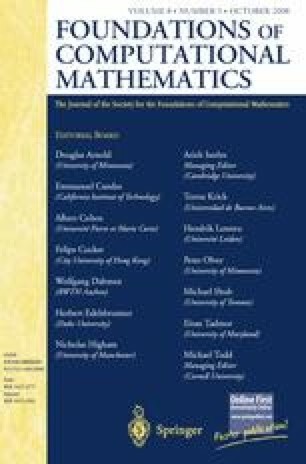 Available from http://www.arxiv.org/abs/math/0411107. D. Bini and B. Mourrain, Polynomial test suite, 1996. Available from http://www-sop.inria.fr/saga/POL. G.-M. Greuel, G. Pfister, and H. Schönemann, Singular 3.0. A computer algebra system for polynomial computations, Centre for Computer Algebra, University of Kaiserslautern, 2005. Available from http://www.singular.uni-kl.de. M. Laurent, Moment matrices and optimization over polynomials—A survey on selected topics, Preprint, 2005. Available from http://homepages.cwi.nl/~monique/. J. Löfberg, YALMIP: A toolbox for modeling and optimization in MATLAB, in Proceedings of CACSD, Taipei, Taiwan, 2004. Available from http://control.ee.ethz.ch/~joloef/yalmip.php.